There's a woodworking adage that goes something like this: "Every one makes mistakes. The difference between a beginner and the Master Craftsman is the Master Craftsman knows how to fix his mistakes." No doubt this is true, but on the long road that leads to Master Craftsmanship, I am still on the 'on' ramp. So I've come up with my own adage: "Make Mistakes Slowly". I was reminded of this Truth while I was carving the stem-keelson-chine joint on Cabin Boy, on this Day 12 of my boat-building marathon. In theory, this joint is relatively simple: it just needs to accept the square end of the chine log. However, the oak chine log bends and twists its way from the last notch in the form into the joint, so the joint must be cut at just the right angle. The only way I could cut this joint was by slowly carving it into the stem and keelson with a sharp chisel. Shave, by thin shave. Testing my progress every minute or two with the chine fid. Interestingly, as the cut got deeper and deeper, I gradually realized that I had the angle off by a few degrees. Not a lot... maybe 5 degrees. But those 5 degrees were important. If I kept cutting at that angle, the lower edge of the chine log would have stuck out of the joint, instead of snugly nestling into the joint. A big mistake! But, since this mistake was developing shave by slow shave, I had time to change course and avert the disaster. 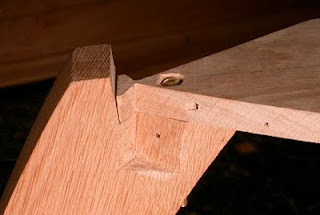 Instead of ending up with two pieces of scrap wood, I ended up with a perfect joint (well, perfect-ish). This, it seems to me, is one of the true benefits of hand-tools vs. power-tools. I have had the same mid-cut sense of impending disaster using power tools, but it only lasts a moment... The next moment, it is too late. The mistake is made, and now fixing it is much harder. In the hands of a Master Craftsman, I'm sure power tools are a huge time saver. But for duffers like me, they are only short-cuts to disaster. For now, I'm going to keep making my mistakes in slow motion. And speaking of slow motion, on this Day 12, I cut the other side of the stem-keelson-chine joint today and and was hoping I'd be able to bed and screw all the bits together today. But I ran into two problems. At the moment, the stem and keelson are only loosely joined by the long bronze bolt. That little gap between the end of the keelson and stem will close up when properly tightened. However, notice the tip of the triangular piece, on the opposite side of the keelson, is chipped off. This did not happen in slow motion. One moment, it was there, the next it was gone. I may have been careless, but upon further inspection, I believe there was a small flaw in the oak that created a weak spot... notice how it chipped with the grain. However, I don't think this little chip is structurally significant, so I'll just squeeze a little more bedding compound in there, and pretend it never happened. Two things are going to hold all these bits together: silicon bronze screws and 3M 101 bedding compound. 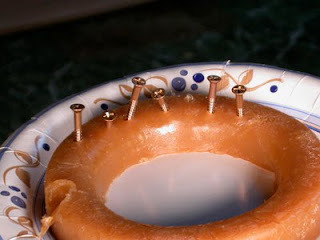 I read in several places that screws should be waxed before being driven into their pre-drilled, and counter-sunk holes. I can't find the reference at the moment, but one of the boat building masters suggested the perfect wax for this job: the wax seal for a toilet bowl. If anyone knows where this suggestion came from, let me know and I'll give credit where credit is due. Not only does the wax make the screws easier to screw in, but it holds them in the 'ready-to-go' position, nicely. Since oak and epoxy do not get along, I need some old-fashioned bedding compound in these joints. There are several to choose from, but I decided to go with 3M 101, based on a number of recommendations. Unfortunately, this blasted tube brought my assembly process to a screeching halt. I bought it off the shelf at a local chandlery, but apparently they don't get many wooden boat builders. It was old and dried out and impossible to pump out of the tube. Curses! Being a small businessman myself, I normally like to shop locally, but from now on, I'm going to stick with the pros. In particular, I would like to give a shout-out to Jamestown Distributors. Experienced boat builders already know about them, but for newbies wondering where to buy stuff, I can't recommend them highly enough. Good selection, prices, customer service, and -- most important for cases like this -- fast shipping. I generally get delivery from them in 1-2 days, using UPS Ground. A big help when you need something fast. 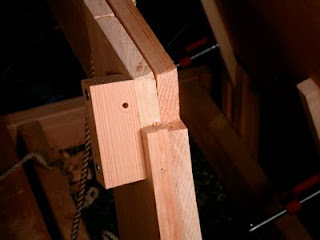 Anyway, stymied in my effort to close off the stem-keelson-chine joint, I decided to tackle the next problem... how to hold the other end of the chine in the notches, so I can plank over it. The aft end of the chine is NOT attached to the transom. It just butts up against it. So you need something to hold the chines in place. Note below, I wrastled it into place with a bit of rope, but that's not good enough. I can't plank over the rope. 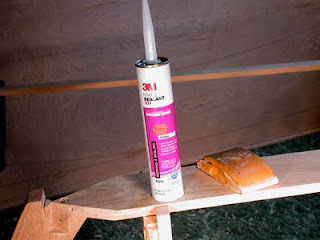 My boat-building friend Roger gave me the perfect solution. I'm not sure what its called, but it is basically a small block of wood screwed onto the side of the form, next to the notch. Notice the hole bored into the block. This hole needs to be big enough to push a #8 screw through from the 'inside' of the boat. This screw will screw into the inside of the chine and pull it into the notch. And that was Day 12. I doubt the 3M 101 will arrive from RI by tomorrow, so I'll probably move on to lining off the hull while I wait for it. If you have your own favorite distributors of boat parts, feel free to give your own shout outs in the comments section, below. This is one of the big problems for newbies, so the more information, the better. I believe it's Rossel in the "Apprentice" book who mentions the wax toilet seal. Does the pix actually show a 1300 BC metal handsaw? I had never heard that oak and epoxy do not 'get along'. Can you elaborate? "Woodworking is depicted in many ancient Egyptian drawings, and a considerable amount of ancient Egyptian furniture (such as stools, chairs, tables, beds, chests) has been preserved in tombs. As well, the inner coffins found in the tombs were also made of wood. The metal used by the Egyptians for woodworking tools was originally copper and eventually, after 2000 BC bronze as ironworking was unknown until much later. Commonly used woodworking tools included axes, adzes, chisels, pull saws, and bow drills. Mortise and tenon joints are attested from the earliest Predynastic period. 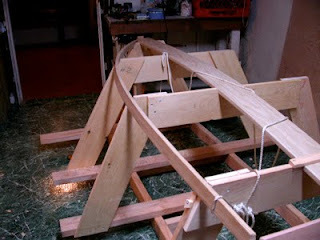 These joints were strengthened using peg [disambiguation needed]s, dowels and leather or cord lashings. Animal glue came to be used only in the New Kingdom period. Ancient Egyptians invented the art of veneering and used varnishes for finishing, though the composition of these varnishes is unknown. Although different native acacias were used, as was the wood from the local sycamore and tamarisk trees, deforestation in the Nile valley resulted in the need for the importation of wood, notably cedar, but also Aleppo pine, boxwood and oak, starting from the Second Dynasty." Epoxy & White Oak: I have read this several times, but of course I can't find the reference now... From what I understand, there is some chemical in White Oak (other oaks may not have this problem) that reacts with epoxy, causing the bond to degrade over time. Maybe others have more info?